Although I have always been fond of individual vegetarian dishes, until just a few years ago the thought of an entire vegetarian restaurant really wouldn’t have appealed to me. I’ve since been convinced that a meal doesn’t need any meat or fish to be great, as long as the food is exciting and full of flavour it’s not missed at all. 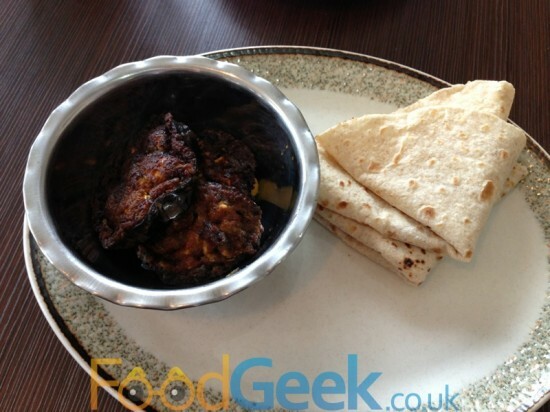 So I visited Mistry’s Cuisine, an Indian vegetarian restaurant on Derby Street, Bolton with a very open mind. Inside it’s basic and feels more like a cafe than a restaurant with it’s serving counter and display fridges. Orders are placed and paid for at the till as well although the dishes are brought to your table. The menu is quite large, particularly the ‘Snacks’ section which includes at least 30! As always choosing was difficult as I wanted almost everything, eventually I settled on a few of them as well as a Gujarati Thali and a Masala Coffee to wash it all down with. The snacks arrived relatively quickly, the ‘Masala Dosa’ was much bigger than I’d expected, tasted fantastic and is an absolute bargain at just £3. 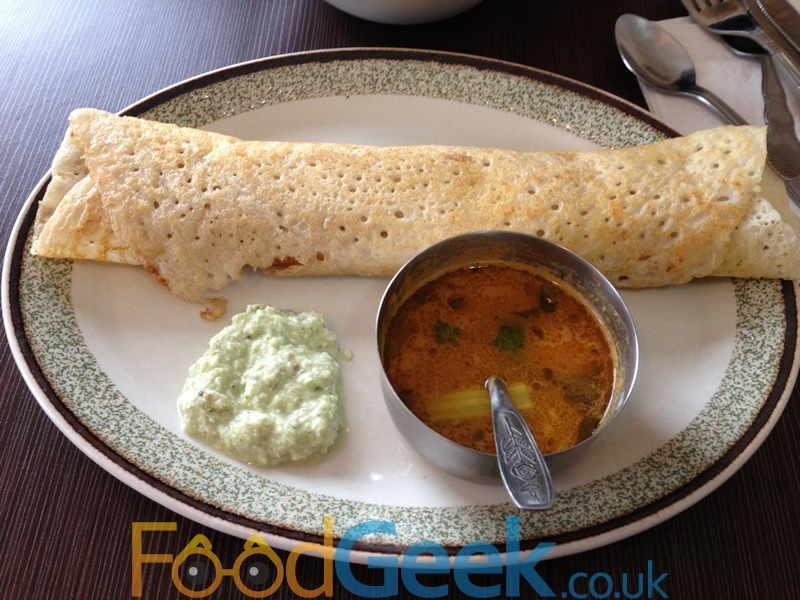 The crispy crepe contained a filling of well spiced, curried potato and onion which was delicious on it’s own but the accompanying lentil sauce added another layer of flavour and heat while the cooling thick, mint chutney contrasted the heat beautifully. The ‘Dahi Wada’ wasn’t quite as tasty but was enjoyable and very interesting. 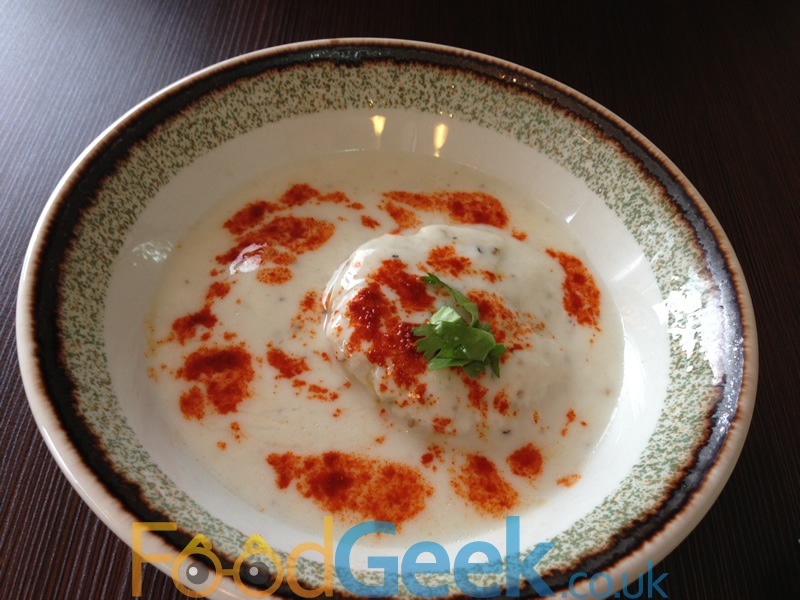 It’s a sort of soft lentil dumpling served in a sweet and spicy yoghurt. I was surprised to find the dumpling was cold and although I did enjoy it found the texture a little odd, the beauty of the dish is the yoghurt topping though which is sweet and expertly spiced with chilli, cumin and black pepper. The next dish, ‘Aubergine Chapati’ might not look like much but was deceivingly delicious. The aubergines were soft inside with a charred and crisp exterior and packed with a huge amount of flavour from garlic and spices. Wrapping in the fresh chapati made a delightful mouthful! 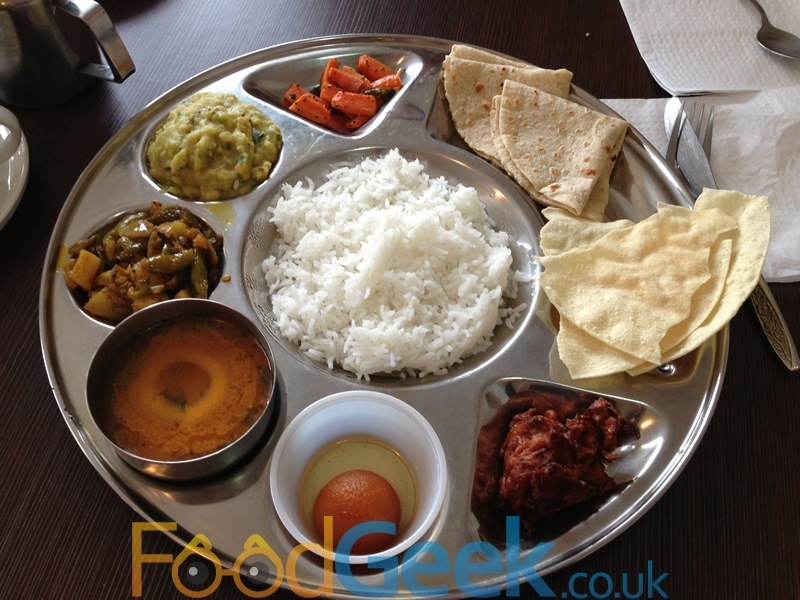 The ‘Gujarati Thali’ was the thing I was looking forward to the most and it didn’t disappoint. A ‘Thali’ isn’t a dish but actually refers to the metal tray on which the various small dishes are served. Mine contained rice, chapatis, poppadoms, vegetable bhaji, carrot salad, more of that amazing hot lentil sauce, 2 curries and a small dessert item! It’s doesn’t look pretty, in fact it reminded me of school dinners but it was one of the most enjoyable things i’ve eaten for a while yet it costs an amazing £6.50! Everything was good but the highlights were the tarka daal (lentil curry) which was creamy and heavily spiced and the tindora, potato & onion curry. Tindora is a vegetable i’d never heard of before, it’s a tropical vine, small, green and looks almost like tiny long, thin watermelons! It tastes like nothing i’ve ever experienced before, quite bitter but worked brilliantly with the onion and potato and again was excellently spiced. It’s traditional for a Thali to contain a small sweet item “to end on” and although I did end on the ‘Gulab Jamun’, it wasn’t the single ball that came in the Thali, it was so good that despite being completely full I just had to order another portion, with ice cream! Apparently it’s quite a popular Indian dessert but I have to admit that i’d never heard of it before, this is probably because I can hardly ever manage dessert in Indian restaurants but maybe the fact that Mistry’s is vegetarian helped me out this time. 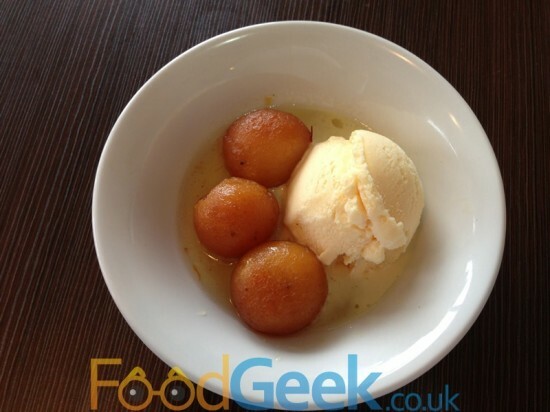 I certainly know about Gulab Jamun now and I love it, they’re small doughy balls a bit like dumplings but are made from freshly curdled milk. Deep fried slowly and at a low temperature so they remain soft and are then soaked in syrup infused with cardamon and saffron. It’s very sweet and I often don’t like desserts so sweet but it gets away with it because of the spices. A brilliant combination of soft dough, sweet syrup and subtle flavours it’s a fitting way to end any meal. In fact I enjoyed it so much I brought a portion home for later too! I’ll definitely be revisiting Mistry’s Cuisine and hopefully very soon. It’s exciting, authentic, delicious and cheap. Yes it’s basic inside and there’s very little in the way of service but it doesn’t matter, it’s all about the food which is brilliant. It’s so flavoursome that I completely forgot it was vegetarian, you just don’t need meat with flavours like this. Next: WTF Is A Parmo Anyway?